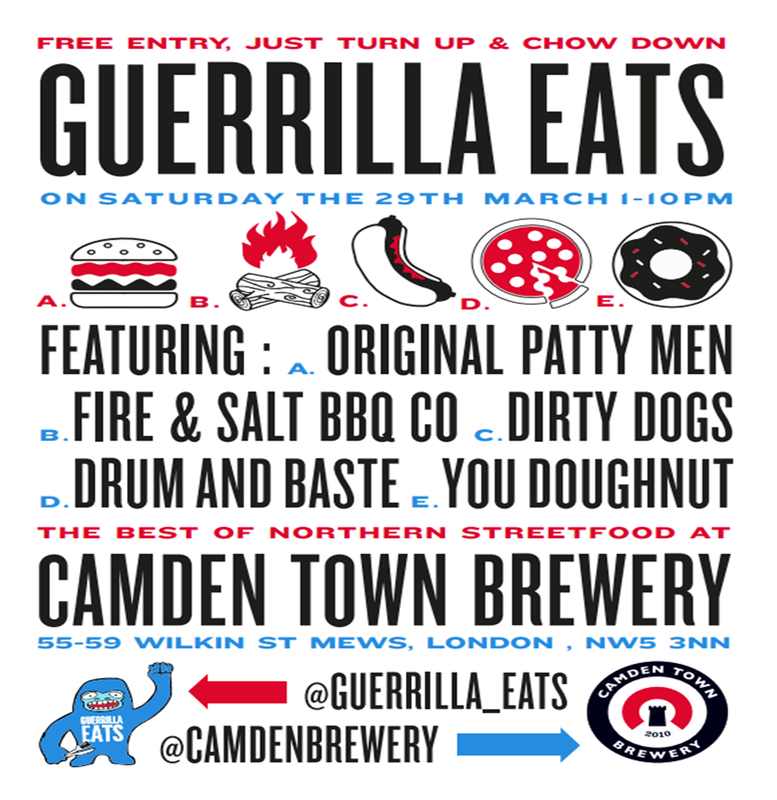 Camden Town Brewery have a special event at their brewery bar this Saturday 29th March - Northern street food traders are taking over, bringing down some of the best of what the North has to offer, including Dirty Dogs, Fire and Salt BBQ, Drum and Baste and Original Patty Men. Each one will be paired with a Camden beer. This is just a one-day event - make sure you're there. "This Saturday Camden Town Brewery street food is going Guerrilla! After ambushing locations in Manchester and Leeds with their pick of the best Northern Street food, the Guerrilla Eats gang are popping up at Camden Town Brewery for their first ever London event! This Saturday they’ll be bringing a whole host of traders to the brewery bar for a day of foody and beery fun and turing our cobbled street into an impromptu marketplace with some of the hottest flavours North of the boarder! From 1pm till 10pm you can sample the street food styling from Dirty Dogs, Fire and Salt BBQ, Drum and Baste, Original Patty Men and YouDoughnut. - Hickory-smoked Brisket, pickled coleslaw, Jackalope (cola-based) BBQ sauce on a brioche roll matched with our limited addition Flue Faker"